Onstream Media is an online video conferencing tool that facilitates businesses operations for different industries. The software service allows you to conduct online conversations, webinars, web castings, and much more at the highest quality and speed. Onstream Media is a generic service and therefore, it targets a wide industry. Whether you belong to a service or production niche, you can effectively carry out online meetings and conferences with your clients. Established in 1993, Onstream Media has been serving the most renowned international brands in the world. It is reputed as a reliable online service that can bring more efficiency to your communication with customers. Onstream Media mainly provides two modules i.e. Onstream Webinar and Onstream Webcasting. Both of these modules are designed to give high quality video and audio conferencing experience to the customers. Each of the modules has features flexible and scalable enough to fit any business structure and budgeting. The Webinar module features live chat and messaging options. You can drop a quick short message instead of an online call. This is particularly useful for communication within the organization as it can save a lot of time. 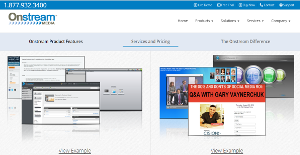 To makes your online conferences more effective, an online presentation customizer is also available. This feature lets you create visually engaging content and help present your product much more effectively to your customers. Dynamic presentations are another addition which can further help emphasize your message. Onstream Media provides real time monitoring and reporting features. Hence you can monitor key performance variables such as webinar ROIs, audience and sessions. You decision making can dramatically improve thanks to the intuitive interface. You also get to share your applications and videos through the video sharing feature at Onstream. With access permission to the content library, all your relevant data files are easily accessible as well. Several other features such as whiteboard and markups, video recording and editing options ensure that your online video content is interactive and understandable for your customers. It is crucial to realize that hardly any software in the Communications Software category is going to be an ideal solution able to meet all the needs of various company types, sizes and industries. It may be a good idea to read a few Onstream Media reviews first as some services may excel only in a very narrow group of applications or be prepared with a really specific industry in mind. Others may work with an intention of being easy and intuitive and therefore lack complicated elements welcomed by more experienced users. You can also come across software that cater to a wide group of users and offer a powerful feature set, however this usually comes at a more expensive price of such a service. Ensure you're aware of your needs so that you get a software that has exactly the elements you search for. How Much Does Onstream Media Cost? We realize that when you make a decision to buy Video Conferencing Software it’s important not only to see how experts evaluate it in their reviews, but also to find out if the real people and companies that buy it are actually satisfied with the product. That’s why we’ve created our behavior-based Customer Satisfaction Algorithm™ that gathers customer reviews, comments and Onstream Media reviews across a wide range of social media sites. The data is then presented in an easy to digest form showing how many people had positive and negative experience with Onstream Media. With that information at hand you should be equipped to make an informed buying decision that you won’t regret. What are Onstream Media pricing details? What integrations are available for Onstream Media? If you need more information about Onstream Media or you simply have a question let us know what you need and we’ll forward your request directly to the vendor.